Backyard ponds and water gardens are becoming increasingly popular. They make an attractive focal point in the landscape. Aside from their beauty, they can also be beneficial by attracting all sorts of wildlife. Water will always bring wildlife. By using native plants it will make it even more appealing, and Florida has a lot of native aquatic plants. Listed below are just a few. Golden Canna (Canna flaccida) makes a great addition to a native water garden with its rich yellow flowers. These flowers are about three inches long and resemble an iris. They grow in clusters on a tall leafy stem and appear in spring and summer. Oval, alternate leaves can be a foot long and three to six inches wide. This canna likes full sun to part shade and will reach a height of up to three feet. It is not often seen in the wild, but has been used successfully in marshland restoration projects. Native from North Carolina to south Florida, it can be found in marshes, wet ditches, bogs, pond edges and lakes. Soft rush (Juncus effusus) grows to a height of about two and a half feet and prefers partial shade. Small brownish flowers appear in the summer at the tops of the grass-like stems. These medium green stems turn brown during the cold weather. It grows in shallow water or wet soil and provides shelter and nesting sites for birds. This rush can be found in ponds, stream edges and marshes throughout Florida. 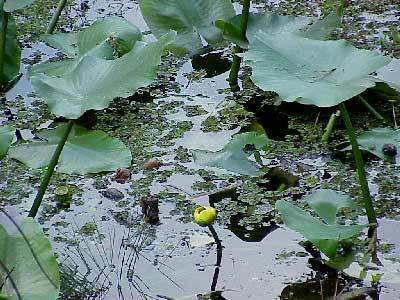 Cow lily (Nuphar luteum) grows one foot above the water in sun or part shade. The two to three inch flowers appear in the spring and early summer. Growing above the water, these yellow flowers have a half-opened appearance. The leaves are heart-shaped green pads that grow on a thick stem and are a foot or more across. This lily produces seed pods that split and release seeds into the water which provide food for the water birds. With the exception of the Keys, it is found throughout Florida in ponds, lakes and slow moving rivers. White water lily (Nymphaea odorata) has very fragrant white flowers, with many petals, that are five inches across. These flowers (which have yellow stamens) float on the water or are slightly elevated above the surface of the water. They appear from spring until fall, open in the morning and close at night and last up to four days. Also quite striking, are the leaves that float on the waters' surface. They are circular with a split where they meet the stem and are up to 10 inches across. This lily is found throughout Florida in lakes, ditches and ponds. Pickerelweed (Pontederia lanceolata) is an aquatic herb that reaches a height between three to four feet. On the tops of the thick stems are tubular spikes of blue-violet flowers that appear during the spring and early summer. Also on the thick stems, are dark green, lance shaped leaves. Although it is easy to grow, pickerelweed can form clumps and become weedy. But it provides a good habitat for water birds (which eat its seeds) and for fish. Except for the Keys, it is native throughout Florida and is found in shallow ponds and on lake shores. There are other things you can do to attract wildlife to your pond. Placing rocks in the sun will provide amphibians with sunning areas. And hollows among the rocks will provide shelter for them. Flat stones can provide perching areas for birds. They will also use these stones to clean their beaks. Whether you have a small pond or a large water garden, native plants will attract more wildlife and are the best choice for a natural look. Allison, James. Water in the Garden. Salamander Books Limited. 1991. Haehle, Robert and Joan Brookwell. Native Florida Plants. Gulf Publishing Company. 1999. All material on this site © Hernando Chapter of the FNPS. The materials on this website may be copied and distributed without permission, provided that it is used for non-commercial, informational or educational purposes, and you acknowledge this site and the Hernando Chapter of the Florida Native Plant Society as the source of publication.